Hard drives fail, and they eventually will. It doesn't matter whether your Mac is with a spinning hard disk drive (HDD) or a solid-state drive (SSD). Data shows that 22% of hard drives fail in their first four years. Is there anything we can do to extend a hard drive's life? Plenty of. But, you never know when your Mac drive is going to fail or crash...and if that does happen, it's a disaster for all the files you've saved on that drive. So, what can you do to prevent it? #1: check the drive health, and #2: backup the data on a regular basis. It may sound simple, but it takes time to well execute the two little tasks. For data backup, we recommend Time Machine (the built-in app already exists on your Mac), and if you can, use a Mac drive clone software as a secondary backup solution. This is usually optional, but we recommend you do so just in case. 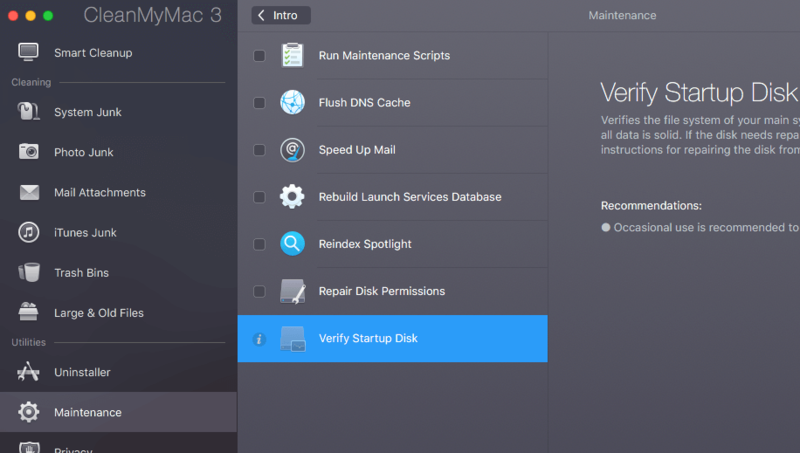 Today, we're going to show you six great tools to check Mac hard drive health, from speed test, disk verifying/monitoring/repairing, bad sector checking, we cover them all. The first handy thing you can do is check the S.M.A.R.T. Status with the built-in Disk Utility on macOS. SMART (Self-Monitoring Analysis and Reporting Technology) is an internal monitoring system that is included in almost all Mac hard drives (HDDs and SSDs). S.M.A.R.T helps you get a basic idea of the health of your Mac drive. How to identify? Just open Disk Utility. Highlight the hard disk name on the left, then check the status from the table (see above). If it shows "Verified", that means your hard drive is not failing. Otherwise, you may need to replace it right away. If your budget allows, consider upgrading to an SSD. Next, check disk errors with First Aid. If your Mac is with OS X El Capitan, macOS Sierra or latest High Sierra, select Macintosh HD on the left and click on First Aid. A new window will pop up asking you whether you'd like to run, just hit yes to continue. Note: For OS X Yosemite or older versions, use the two buttons on the right corner "Verify Disk" and "Repair Disk" instead. ​Developed by MacPaw Inc., CleanMyMac﻿ 3 is mainly used to help make more room on your almost full hard drive (or SSD). The app deep scans and cleans your Mac system and can free up tons of disk space. To verify your Mac's startup disk, all you have to do is open the app, go to Maintenance > Verify Startup Disk and click "Run". In addition, you can use CleanMyMac to do a number of other things like finding old & large files, clearing up Photos/iTunes junk, removing extensions, uninstalling﻿ Mac apps in batch, and more. 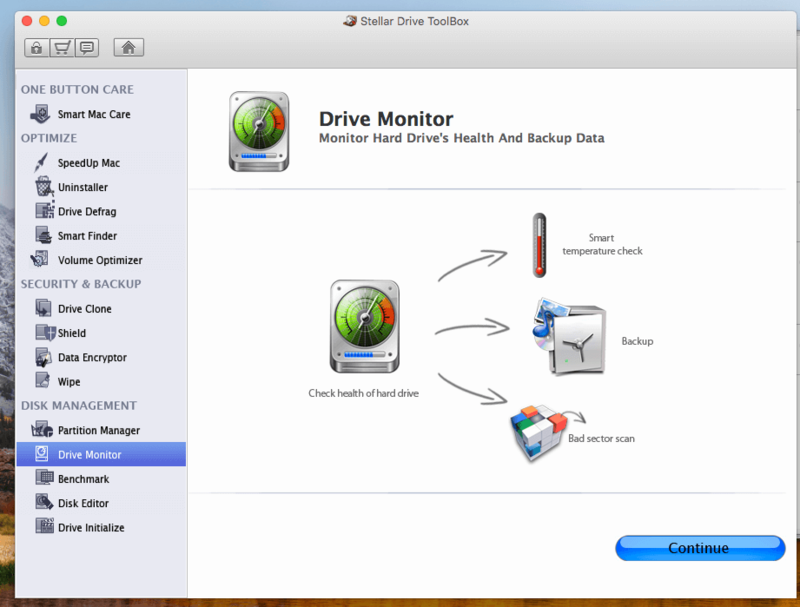 Stellar Drive Toolbox is an all-in-one app includes a number of disk utilities (optimization, protection, sanitization, repair, and more) that help keep your Mac hard drive in good shape. Best of all, it can health check your Mac hard drive for bad sectors. What are sectors? They are basically blocks of space on a disk drive. Bad sectors are blocks that are damaged thus cannot be read. Just open the app and navigate to the "Drive Monitor" section and click the "Continue" button to scan the disk. If it turns out the number of bad sectors is increasing, it's probably time to replace the Mac drive in case of accidental corruption or crash. Please note that the app currently doesn't work with Macs with flash storage (i.e. SSD). 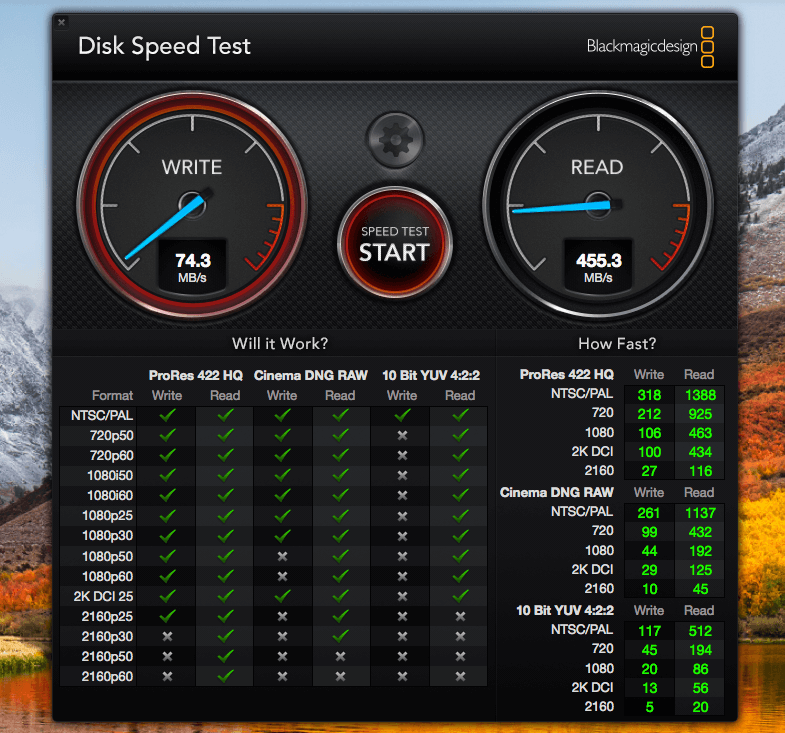 If you feel your Mac hard drive (or solid state drive) is slow to respond, it's good practice to test its write/read speed and benchmark with the industry standard. You'll love this free app made by Blackmagic. It's an amazing yet simple-to-use app that allows you to quickly benchmark and certify your Mac drive performance. After installing the application on your Mac, open it and next, click on the START button located in the center. Soon you'll see the numbers shown on two speedometer circles.Note: it's best to quit all other active apps before using Blackmagic Disk Speed test, this helps get more accurate data. iStat Menus﻿ 6 is an advanced Mac system monitor for macOS menu bar. It can notify you of a wide range of events that you care, for example, usage of GPU, memory, disks, network, sensors, battery, power, and more. 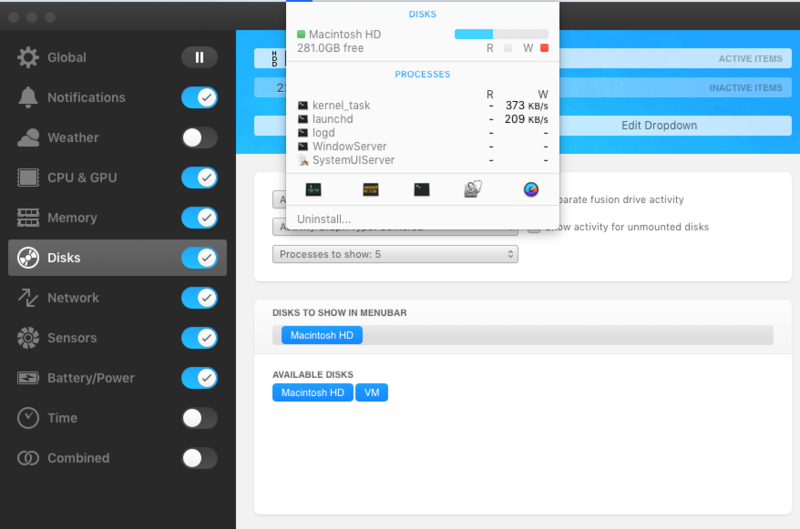 It's very convenient and handy and in this case, you can rely on the disk monitoring tools to monitor SMART status on your Mac hard drives or SSDs. Although it won't avoid your Mac drive from failing, you can use it as an indicator of potential disk problems before they occur.New update: unfortunately, iStatMenus won't work with Macs with flash storage (all models shipped in 2016 or later) due to the fact that Apple no longer allows third-party software tools to check the SMART status of an SSD. CleanMyDrive, the little brother of CleanMyMac, is another useful Mac disk health check app and it's totally free as well. The app is more like a lightweight drive manager for both internal Macintosh drive and external disks. You can use it to check your hard drive status, e.g. a visual look of how your drive is used, how many junk files exist. If CleanMyDrive detects any hidden junks, you can use the app to clean them automatically within a few clicks. Note: the app works amazingly well with USB flash drives, SD memory cards, etc. That's all that we wanted to share. Hope you have picked up some of these apps and good luck keeping your Mac drive in good shape. One last thing: don't forget to make backups!